In ancient times, Balinese people must have a skill, especially skill in developing artwork. Like Rangrang, woven fabric in Nusa Penida, Bali also has a woven fabric called Endek. Woven fabric is considered not only a common thing in Bali, but it is also as a form of identity and cultural artifacts. Although Endek has existed since the 18th century, but its development has only begun since the era of Indonesian Independence around the 80s. The origin of the Endek is in Gelgel Klungkung during the reign of King Dalem Waturenggong who develops it in the Klungkung area, especially in Sulang Village. As a product of artifacts and cultural identity, Endek is commonly used by Balinese people while performing various custom rituals in Pura. At the beginning of the 18th century, it becomes a status symbol, like the Balinese songket, the Endek cloth was worn by the nobles and certain people at that time. As time goes by, the endek fabric begins to follow the transformation of time; this is due to the increasing number of enthusiasts and the creativity of craftsmen to meet the demand for Endek cloth as the souvenirs. Various new designs are created which is a not only limited to basic design from the depiction of flora, fauna, and mythological creatures in Balinese Culture. 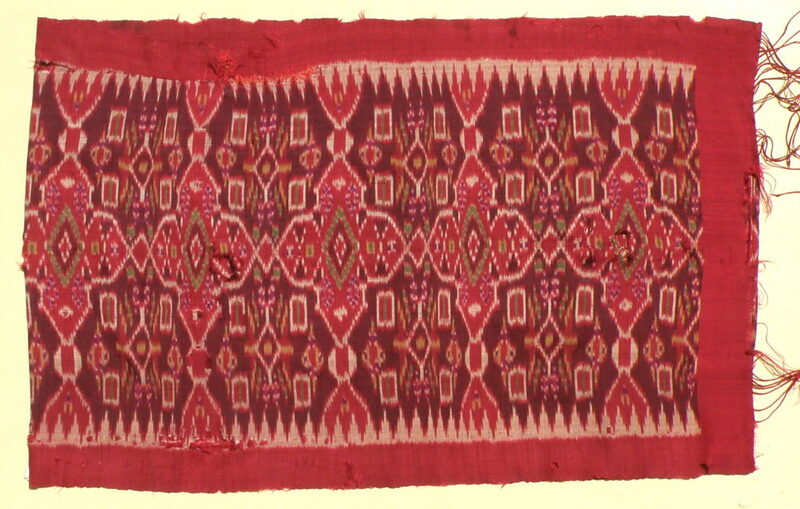 Existing model weaving technique is also developed and implemented in the process of making Endek, such as the addition of coletan on woven fabric in a certain part or called Nyantri technique. Nyantri technique is a technique of adding color to the cloth using bamboo brush like painting on cloth. Generally, endek is divided into 2 forms, namely sarong commonly used by men and long cloth commonly used by women. The characteristic of sarong is having a connection on the middle or side; meanwhile, long cloth is having a decorative design at the edges of the fabric where in the middle is a plain design. Endek can also be combined with songket. Balinese songket is a kind of fabric that has gold thread or silver thread ornaments where this ornament technique can also be applied on the Endek. Endek that has gold or silver thread decoration at the edge is called Endek Songket.